We have a strong desire to assume that a non-racist, liberating education is possible. But who is this ‘we’? People talking about “saving public education” tend to be associated with Higher Ed institutions in some way, whether from working in or graduating from one. This desire seems to be far less evident in people who haven’t invested their identity in such an institution. People who are engaged in struggles that strike directly at the heart of the dominant order—like prison labor strikes and hunger strikes—tend not to ask for anything about this order to be saved. In their struggles, they are practicing an alternative to education—mapping and building social relations across prison cells, analyzing the terrain of surveillance for blindspots, experimenting with covert communication techniques, formulating effective demands, etc.—practices of collective studying that makes their organizing a kind in which “every crook can govern.” To reduce prisoners’ autonomous study to education would not only disrespect their ingenuity but also foreclose the possibility of studying with them across the prison walls. A revolutionary alternative to education can also be seen in indigenous people’s struggles to undo the ongoing history of dispossession from their lands, for instance, with the Indigenous Nationhood Movement. With direct actions, such as blockades against fracking, they practice an insurgent politics toward abolishing the flows of commodified resources that churn the gears of capitalism. Indigenous peoples simultaneously enact a resurgent politics through reclaiming their land, revitalizing their cultural traditions, and reconnecting their lives in relations of reciprocity with the non-human world. In insurgence and resurgence, indigenous peoples study with each other in ways that are radically alternative to those of education. Reflecting on these contrasts can draw out what is at stake in my call to de-romanticize education. 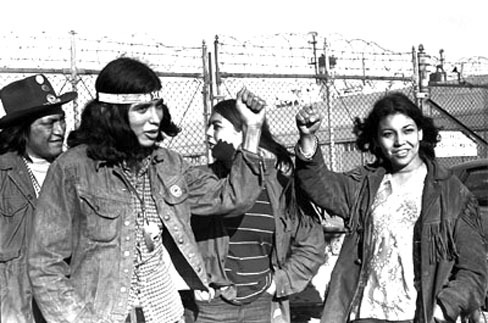 Prisoners’ study and indigenous study are practices for composing alternative worlds—not alternative forms of modernity, but alternatives to modernity and its underside of colonial-racial-hetero-patriarchal-capitalism. Naïve faith in education gives a shortcut around the challenges of integrating study with revolutionary organizing. Instead, we should drop the abstract concept of ‘education’ in favor of the differentiating concept of ‘regimes of study’—that is, sets of practices, institutions, and processes that enroll people in particular ways of knowing, teaching, and learning. The major regime of study today is the education-based regime. Its key features are credentialed experts who teach and give exams, which prepare students for participation in governance. There are many alternative regimes of study associated with ways of composing the world alternative to modern/colonialist capitalism. To promote a regime of study based on continual circulation of study-knowledge-and-teaching, we can take the relay from indigenous communities, DIY study groups embedded in organizing, as well as movements that have sought to contest the education regime’s control of the resources for study. The Black Campus Movement sought to abolish the White University and expropriate its resources for Black study. 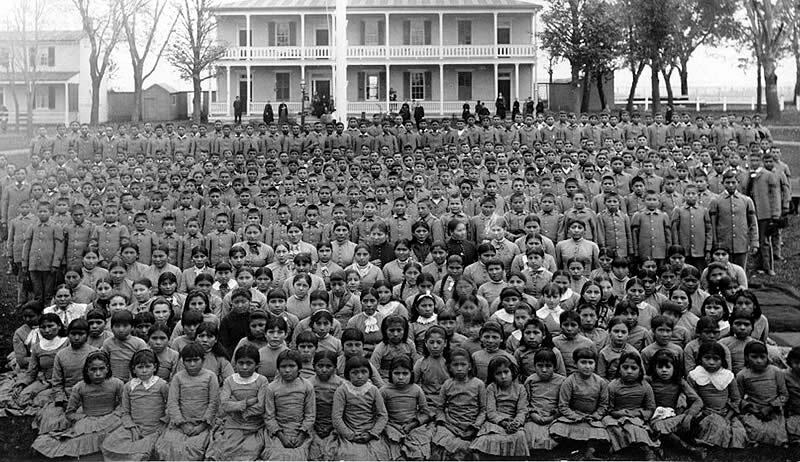 American Indian and First Nations movements sought to replace the Colonial University with the Indigenous University. Feminist and Queer movements sought to abolish the Hetero-Patriarchal University. Communist movements sought to abolish the Capitalist University. In these movements—and often in radical struggles—what participants called ‘education’ would have been better described as an alternative regime of study. Calling for their own kind of ‘education’ can have politically useful, tactical purposes (e.g., making a claim on the resources assigned for ‘education’). But, it also has many pitfalls from confusing their own resistant practices with those of what they are struggling against. Thus, I argue for using the language of ‘regimes of study’ for analytical purposes—i.e., in developing critical analyses of strategy, visions, etc., which can include discussion of uses of ‘education.’ In a particular struggle, for instance, to take over a campus and foster an alternative regime of study in that place, the movement could tactically use slogans like ‘defend public education’ but, simultaneously, have some critical analysis amongst their group about how they are seeking to avoid reproducing the education-based regime of study and to enact and foster alternatives to it. The revolutionary campus movements fell far short of their goals, as evidenced by the marginalization of their projects within small ‘Studies’ departments and by the predominance throughout the wider academy of the projects they sought to destroy. Resistant study projects still emerge from these departments and they occasionally connect with wider movements. Yet, the game is rigged against them, as the wider institutions of universities are fully enmeshed in the education-based regime of study—on the top of the pyramid of education. Despite education administrators’ tight rule over the pyramid, alternative practices of study happen in its cracks. Students create a group against sexual violence. Custodians coordinate a work slowdown. Contingent faculty organize a union. In their organizing, they integrate practices of study—such as mapping the campus and their social relations—that have nothing to do with the education regime’s exams and expertise. They contest the use of the university as a place for study. 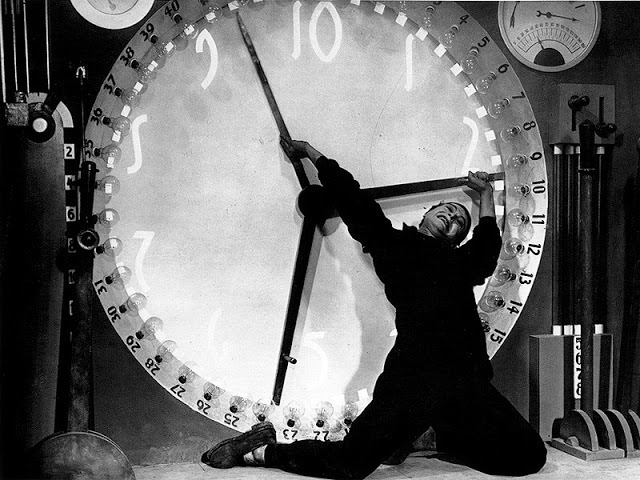 The education regime’s way of seeing the world relies on a view of time as separate from space and as linear and developmental, on a two-dimensional scale. 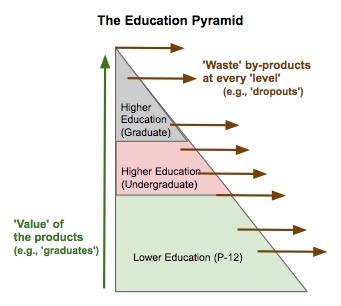 Students who subscribe to this view see themselves as individuals hurtling into a future with possible trajectories of either going ‘up’ as a valued graduate toward economic productivity or ‘down’ as a ‘dropout’ toward criminality. This discourse of ‘dropout’/’graduate’ was developed in the 1960s to stigmatize potentially resistant youth through individualizing of responsibility for social crises onto future-oriented students. As an antidote, we can draw from indigenous conceptions of the world that refuse such individualizing imaginaries through their rejection of dichotomized ‘space’ and ‘time.’ Grounding our bodies in particular places, we can make meaning for our lives through telling stories about our relations with these places and the people and things in them. A first step for such a re-grounding has to be to acknowledge that universities and prisons are built on indigenous land, and that the dispossession of indigenous peoples from that land was the key precondition for building the regimes of racial capitalism on it. We can unsettle our ‘selves’ and our relations with these places through reconnecting with the land in ways that take responsibility for undoing the mess of settler colonialism. Indigenous movements have often reoccupied land for purposes of decolonizing and resurgence, such as the Alcatraz occupation of 1969-1971. Likewise, the Black Campus Movement occupied buildings, such as the Allen Building at Duke University in 1969, creating the Malcolm X Liberation University. 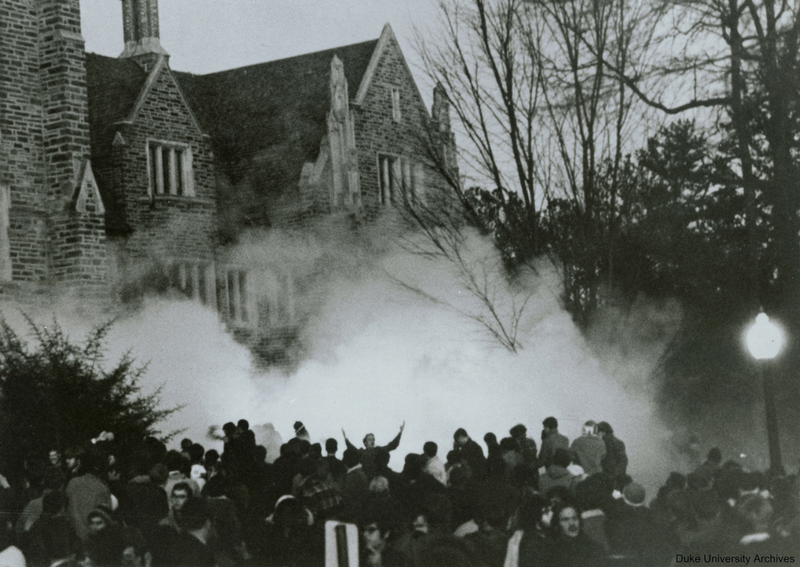 Allen Building takeover at Duke University – protesters attacked with tear gas (image via). The state reacted with infiltration of the movements and repression of their most militant leaders, often imprisoning them. This was the beginning of the era of mass incarceration. The movement kept their relationships alive across the prison walls through prisoner support groups and occasional jailbreaks. In some contemporary struggles at universities, the places have become sites for re-articulating new relationships in and through regimes of study alternative to that of education. In the occupation of Wheeler Hall at Berkeley in 2009, students and workers broke “the glass floor” through creating affective relationships, or “lines of care,” between their bodies across police barricades. Some participants have highlighted the difficulties of bridging these campus struggles with movements against policing and incarceration of working class people of color in nearby neighborhoods, such as East Oakland. The Left creates its own imaginal obstacles to seeing how prisons and universities are co-constitutive through subscribing to liberal narratives, like ‘dropout’/’graduate’ and ‘school to prison pipeline,’ that romanticize education and see incarceration as its despised Other. Some projects are taking on these obstacles, such as Damien Sojoyner’s de-mystifying of the ‘school to prison pipeline’ by showing how schools have long been places of policing young people, with a case study of Los Angeles’s programs of police in schools in the 1960s as means of suppressing Black Radicalism and normalizing racial oppression. Through such critical historicizing of the ‘school to prison pipeline’ metaphor, it can become a useful tool for drawing attention to the long-standing co-implication of schools and prisons as disciplinary institutions of racial capitalism. By contrast, the ‘education not incarceration’ framing—with its naïve treatment of education as a social good—might be impossible to recuperate for radical purposes. Conversely, comparisons of universities with prisons, such as implying deviation from their educational mission into becoming “ivory cages,” also pose such an extreme challenge, though perhaps not insurmountable. Such comparisons can foreclose thinking about the ways that the institutions are co-constituted with each other within racial capitalism. Yet, if framed carefully, they can also be used to show how the institutions share common logics—they both perpetuate logics of the regimes of carcerality and education, which are instantiated in crucially different but inter-related ways. The problem of romanticizing education (and conversely, demonizing incarceration) often arises from a failure to make these distinctions between ‘institutions’ and ‘regimes,’ their different types, and how they are related. Comparisons tend to imply assuming the possibility of creating institutions of schools and universities that are ideally free of carcerality and full of education. Such an ideal is romanticizing because the regimes of carcerality and education have always co-constituted each other and infused all institutions of racial capitalism. Against this historical neglect, movements should articulate our ideals in ways that call for schools and universities free not only of carcerality but of education as well. Inspired by the revolutionary campus movements who fought for a ‘Black University’ and an ‘Indigenous University,’ we should demand, not ‘free education,’ but ‘freedom from education.’ Through reoccupying the places that have been used for both education and carcerality, we can turn them toward other purposes: to enact alternative regimes of study in and for our revolutionary movements. In addition to such de-romanticizing, the best paths toward breaking down these obstacles are through study embedded in organizing with the people who are most affected by the brutal, exploitative functions of both prisons and universities. The beginning of an abolitionist regime of study can be created through connecting with campus workers and students who are more likely to have friends and loved ones in the penal system. Collaborating together, they can build relationships and communicative, co-research projects with the inmates of jails and prisons so as to amplify the voices of those inside. At the same time, refusing to fall back on a view of education as redemption, those working and studying on Higher Ed campuses can take the relay from the revolutionary energies of their inmate collaborators. Seeing the regimes governing the spaces inside the campus and the prison as serving inversely related functions in the same racial capitalist, settler colonial world, they can devote their energies to expropriating the resources of their campuses and organizing and studying for a decolonial, abolitionist world in which there would be no prisons—and maybe no universities either. Abraham Bolish [pseudonym] is an independent researcher who lives and organizes in the Southeastern United States. Let me try to be a little clearer… I think that coining a term is not necessarily helpful because the institution will take that term, hollow it out and use it for its own purposes. The critical analysis is important, not a specific term. I like to think of concepts as being able to play different roles in different circumstances. To represent this flexibility, I use the metaphors of thinking of concepts as TOYS, TOOLS, or WEAPONS, depending on the situation. And, let’s say I keep these in my toy box, toolkit, and weapon bag, in relations that I know that they can have with other conceptual toys, tools, and weapons. So, when I’m playing around with my friends, i.e., folks who are on relatively similar political grounds, I’m usually talking with them in an experimental way where we’re using our concepts as toys – having fun with them. If we’re trying to get something done, we might be working with our concepts as tools. Yet, if I’m engaging in discussion with my enemies, i.e., folks who are on quite oppositional political sides from me, I might be using my concepts as weapons, to force them do something (though probably also using some concepts as tools as well – e.g., for doing the work of convincing them to take on my perspective). So, if you have any ideas on how I could frame it better, I’d love to hear them. Would you prefer some concept other than ‘regime’ – e.g., culture, paradigm, lifeworld, or… ? Thanks again, so much, for your engagement with my essay. I’ll look forward to talking with you further. First of all, the connotations of regime (authoritarian, hierarchical) don’t make me want to claim it as my way of study. This also pertains to why i’m not interested in coining a term (any term for that matter) to describe an alternative method of study. 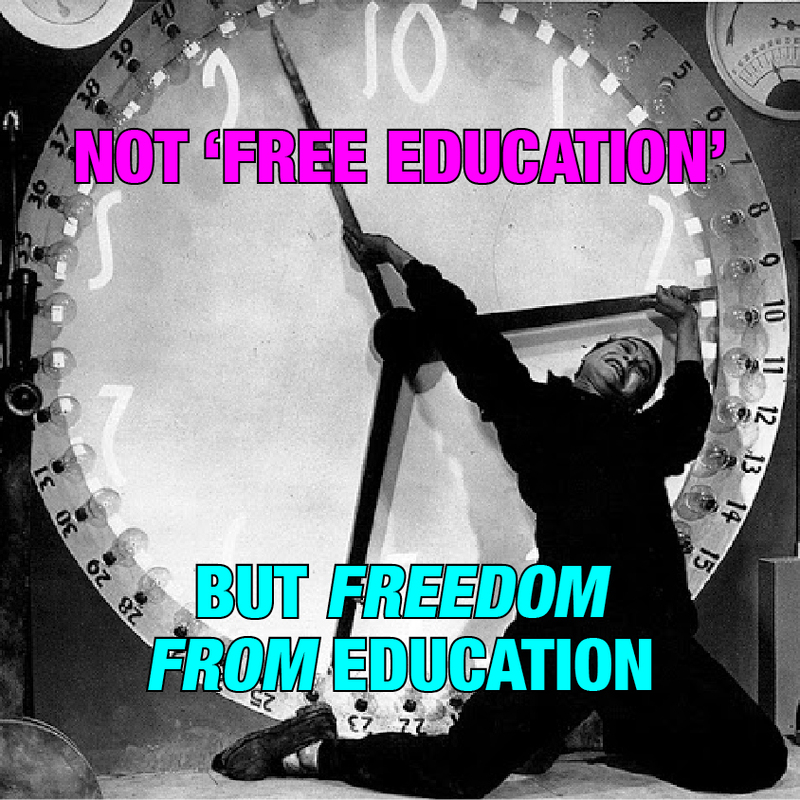 I never articulated this before so I am probably not expressing this very coherently, but, in my opinion, strict terminology that the current education system supports is very present in radical circles. If you are to be a good radical you need to know all the right terms to use in a given situation because somebody who understands how to be a better radical than us coined or uses the term. This is in my opinion doesn’t encourage general play with, discussion of, or further analysis of the structures and relation/ships. This is precisely because this type of coining of a term or phrase is done to give legitimacy to the author (like how you write an argument or dissertation). I believe these methods within the education system that are used to produce meaning need to be questioned and overturned as well. So I’d much rather use a different term each time depending on the particular situation and how I’m approaching it. Does that make sense? I’m not saying you must be this way to be right… because of course you’re coming at this from a different place than I am. Thank you, Jacob, so much for this clarification. This does make sense now and I find your point to be extremely helpful. I agree with you that ‘regime’ tends to have those negative connotations, and I like that the couple alternative terms that you used (“way of study” and “method of study”) don’t have those connotations. The reason I initially picked up on the ‘regime’ term is that I read it used in an article about the politics of transportation in relation to what they called “regimes of automobility” (to unsettle people’s usual acceptance of the dominant, car-based regime and to open up possibilities for thinking about alternatives, like regimes centered around bicycles, pedestrians, and public transportation). I thought that ‘regime’ could be similarly applied for thinking about the politics of oppositions between education-based ways of study and alternatives to it. Yet, I think that your line of critique here has gotten me to see a fundamental flaw with my attempt to shift that ‘regime’ language from the world of transportation to the world of studying: in a relatively greater way than in the former, in studying the words that we use, and our norms for using words, are a more integral part of shaping our way of studying. Particularly, this means that, as you insightfully point out, “methods within the education system that are used to produce meaning need to be questioned and overturned as well.” Thus, I think that what you were calling me out on here was my unintentionally falling back into a norm of the education system, regime, or whatever—i.e., the norm of obedience to expertise, where experts define specialized jargon, get legitimacy within the academic hierarchy for sounding ‘smart,’ and evaluate others on the basis of their facility with understanding and speaking their jargon. In response to this problem, the solution you propose seems right on: “So I’d much rather use a different term each time depending on the particular situation and how I’m approaching it.” I’m going to take this point to heart and elaborate on it in whatever I write next about this stuff. For now, I’ll just say that I think this tactical flexibility with language is something that I have tried to do in practice, if not always in theory. This is along the lines of what I was getting at with my discussion in my previous reply about seeing concepts as toys, tools, or weapons, depending on the situation. In my usual engagement in discussion of education issues (e.g., in organizing this free university: http://www.excotc.org/ ), I don’t think that I’d ever tried out the ‘regimes of study’ term, though I did say things like ‘ways of studying’ or ‘modes of…’ or ‘approaches to…’ ‘Regimes’ seems to imply a kind of intensive and extensive institutionalization of practices of studying, teaching, and learning (and maybe a kind of hierarchization of those practices too). I can imagine some situations where that term might be useful (especially in a critique of the education system). But, I think that I’ve come around to agree with you here that it’s rarely going to be useful in practice (though maybe sometimes it would be, so I’m not throwing it off the table just yet). Thanks again for your very helpful feedback, which I’ve found quite transformative for my own thinking! Do you feel I’ve responded adequately to your comments? I’ll look forward to continuing our conversation. WOW. I would love to hear the more academic stuff, Abe… Thanks for your great writing and work!